1. First make a brief visit to the Rules, and take particular note of the rules for advertising. 2. Introduce yourself! Fans of your work will be so excited to see that you are participating in the forum. And don't forget to connect your brand name with your username if they aren't the same, so people will know who you are and what dolls you represent. You might want to include links to your website and other places you have a presence on the internet, such as Flickr or Facebook. 3. Make yourself a thread in the Discussion by Artist subforum. You can fill your first post with useful information about your dolls such as sculpts offered, measurements, prices, website links, and more! You can also provide an artist's statement to acquaint fans with your purpose and driving reasons for creation. This post can later be edited to include new information about your dolls. Your thread in this subforum will be the main place fans and owners of your dolls will discuss, ask questions, and share information about your dolls. You may find that your fans have already created a Discussion thread for you. In this case, it is up to you whether you would like to join the existing thread or create a new one. If you create a new one, the fan-created thread will be locked and a link will be posted to the new artist-created thread. 4. Perhaps you would also like to make a thread in the Gallery subforum! There you can post some of the most beautiful pictures of your dolls for others to admire. You can also post comparison photos of your dolls with other dolls. 5. The Doll News subforum is your friend! It's the best way to keep members updated about new doll releases or sales. 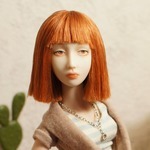 We hope you will find this forum an exciting and useful way to interact with the porcelain BJD community. If you have ideas about how to make this experience even better, you can contribute them in the Ideas and Requested Features subforum. Thanks and see you around the forum!